What goes around, comes around: Fabio Lione (Rhapsody of Fire) is back with Olaf Thorsen's Vision Divine. Whether you consider that good news or not is a matter of personal opinion. Frankly, I enjoyed Michele Luppi's vocal work especially on the last Vision Divine work, The 25th Hour. The better news is that Vision Divine continues on and has released another fine disc of melodic metal in 9 Degrees West Of The Moon. This time, though their promotional media says otherwise, I find less power metal and more melodic heavy metal with progressives spices added throughout. Being a fan of Vision Divine, and a sucker for most any melodic metal especially power, progressive or traditional, makes it hard to be totally objective in my review of 9 Degrees West Of The Moon. I loved it. It's hardly perfect, but it is filled with great compositions consisting of infectious vocal arrangements performed by Lione and sizzling fret work from the Thorsen. 9 Degrees begins with power metal on 'Letter To My Child Never Born,' a fast heavy, and quite bombastic piece. But about four and a half minutes in your treated to a powerful piano driven segue which upsets the power metal apple cart. From here to the end, as I mentioned, this disc sounds more like typical (in a good sense) melodic metal with progressive notes. As examples, 'Violet Loneliness,' the best cut on the album, offers a lighter melodic touch thanks to the rich vocals and vocal arrangement. 'Fading Shadow' starts heavy and quick yet is quickly overshadowed by melodic metal and solos provided by both synth and guitar. This trend continues and forms the main substance of 9 Degrees: strong vocal arrangements complimented by savvy keyboard and guitar work especially in the solos. Additional gems are both 'Fly' and 'Out In Open Space' (best vocal arrangement on the work). The real surprise, and the one song that really puts the 'heavy' into Vision Divine's melodic heavy metal, is their cover of Judas Priest's 'Touch Of Evil' form Painkiller. I know many rave about this album, but it was never one of my favorite latter era Priest albums. 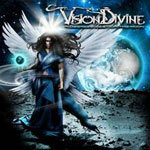 Vision Divine's interpretation is thoroughly convincing and flattering simply because of its raw power and enthusiasm. Vision Divine's 9 Degrees West Of The Moon continues Olaf Thorsen's tradition of delivering consistent, creative and pleasing metal. This work seems to depart from the power side of metal in previous works, emphasizing instead more melodic metal. Yet the result is the same: savvy and robust metal. Very recommended! Vision Divine's 9 Degrees West Of The Moon continues Olaf Thorsen's tradition of delivering consistent, creative and pleasing melodic, power, progressive metal. This work seems to depart from the power side that previous works emphasizing more melodic metal. Yet the result is the same: savvy and robust metal. Very recommended!